Senehasa has helped a number of individuals to set up small businesses following the Tsunami. Many are replacing businesses or livelihoods that were destroyed by the Tsunami. Here a some examples of help that Senehasa has given. 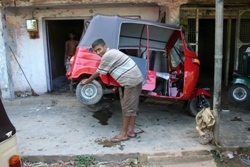 Sunil Wijeratne and his son Chanaka have rented a shop and started a three-wheeler repair business. They needed capital to buy a stock of spare parts. Sunil has worked as an enthusiastic, reliable and ever-willing driver for Senehasa. Chanaka, now 18 years old, will run the repair shop while his father oversees the business. His mother will control the stocks and keep the books. Chanaka worked in his cousin’s repair shop in Galle before the Tsunami. The business was washed away; his cousin lost his son and has now moved to Oman. Chanaka always wanted to be a mechanic and already earns Rs 800–2,000 a day by doing 10–20 repairs. Currently, the three-wheeler drivers have to bring their own spare parts. With Senehasa funding, Sunil and Chanaka will be able to attract more business as well as earning profit from the spare parts business. Weerakody has started a barber’s salon in the village of Unawatuna.. The salon is built obove another shop that Weerakody rents to a jewellry store. This brings in vital regular income for his family especially as the barber’s business is dependent on the tourist trade and there are not many visitors after the Tsunami. 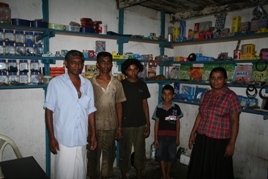 Senehasa has helped Saman, a local baker in Unawatuna, to rebuild his bakery and home above it, following the Tsunami. He now bakes bread throughout the day and night getting only a few hours sleep. He makes deliveries to local shop and cafes early morning and in the afternoon. He employs two men who work shifts.. Saman built a special wood burning stone oven to bake his bread which looks a little like a pizza oven. They use long wooden “paddles” to put the bread into the oven. He makes Rs 800-1000 profit per day. Senehasa has also paid for a new cake mixer for Saman so that he can develop his cake business. Saman has bought a van from his earnings and also uses a bicycle to take his bread and cakes to shops and cafes. 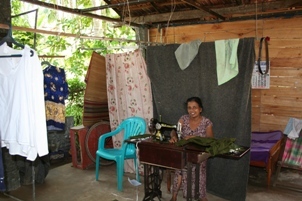 Karunaratne has set up her shop outside her rebuilt house and makes and sells clothes and acessories for tourists. She has asked for mesh to secure and protect her property. She hopes to make Rs 10,000-15,000 per month and sometimes makes as much as Rs 2,000-3,000 on a good day. Other locals bring her goods to sell and she also makes clothes and bags to order. Senehasa has built a new house with a sewing workshop for Dulcie and her husband, Tharusa. The workshop is fully equipped so that they can carry out a variety of jobs. They were both tailors before the Tsunami but lost everything.They are glad to get back to sewing to earn a living, with both able to work from home. They have four children. Out of season they earn only Rs 180-200 per day each but around the Sinhala and Tamil New Year they earned over Rs 1000 per day. Dulcie and Tharusa also benefit from a regular income from Senehasa for making uniforms for Senehasa Sponsorship children and baby clothes for babies on the neo-natal ward in Mahamodera Hospital. The new house and workshop have electricity.